Let’s face it—for some tasks, you just don’t need position accuracy to the quarter-inch. Have a vehicle dedicated to tillage that you only use twice a year? Maybe you found a too-good-to-pass-up deal on a used lightbar or yield monitor, only to discover that it did not include a GPS receiver? 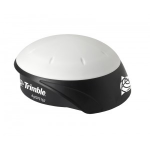 The Trimble AgGPS 162 is a low-cost smart antenna ideal for applications that require less demanding accuracy levels. This unit provides simulated radar speed output as well. The AgGPS 162 uses the L1 signal only; if you are looking for better accuracy and repeatability, look for the receivers that support L1 and L2 signals (such as the Trimble AG-372).